Flash radiography is a very useful technique for capturing high speed events. Kinetic energy penetrators, explosively formed projectiles, shaped charges, reactive armour, hypervelocity impact ….. The list is long. Research field where high speed phenomena play a crucial role are many and important. Advanced computers and sophisticated computer codes can do some of the work, but their usefulness is limited. In the end testing is left as the primary means for assessing new data. With the increasing complexity and cost of today’s products, a great number of measuring methods have to be used to get maximum information from each test. Finding reliable high performance instrumentation to record and investigate fundamental phenomena is a key to successful testing. Among the methods used to effectively diagnose high speed events, flash radiography is one of the most important. Flash radiography makes it possible to see what visible light cameras miss. Events that pass by in a blur or actually seem invisible are effectively stopped and unmasked. We can offer a complete line of compact, easy to use, modular flash X-ray systems. Flash X-ray systems are usually characterized by their operating voltage, penetration of different materials and exposure time. Operating voltage is the voltage that is applied to the x-ray tube. The operating voltage determines the energies of the x-ray photons emitted from the tube. Penetration is a measure of the maximum thickness behind which x-ray images can be obtained. The penetration is specified for a given material and distance from the x-ray tube. Penetration and operating voltage are closely linked. A higher operating voltage gives a higher penerations. A flash x-ray system has a fixed exposure time. The system is designed to give an exposure time short enough to effectively freeze even very high speed events. 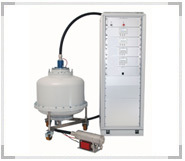 Our self-contained tubes are exceptionally rugged and are designed to survive tough proving range environments. Flash x-ray systems are often used to study very violent dynamic events. The x-ray tube is usually positioned close to the event and must therefore be able to withstand strong shocks. We have designed a line of very rugged, self-contained, stainless steel tubes that can cope with these situations. The tubes come in two versions, straight line tubes where the x-rays are emitted along the tube axis and right angle tubes where the x-rays are emitted at 90 degrees to the tube axis. The tube is connected to the pulse with a high voltage coaxial cable. The length of the cable can be chosen to fit the layout of the test. 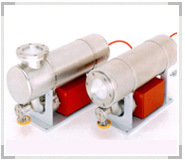 Our x-ray tubes and tube cables can easily be interfaced with pulsers from other manufacturers. Multi anode tubes are used to minimize parallax and create x-ray movies. In some cases very closely spaced x-ray sources are needed to minimize parallax. For these applications we have developed so called Multi Anode Tubes. 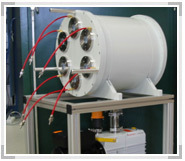 These tubes have several fine focus x-ray sources built into the same vacuum enclosure. One pulser is used for each source. The pulsers are fired in a sequence, and the times between the exposures are set by delay generators. The radiation from the tube is directed onto a fluorescent screen places behind the object. The screen converts the radiation into visible light and produces visible images on the back side of the screen. These images are captured, intensified and stored by a high speed camera. Multi anode tubes are usually designed for a specific application. The number of sources, their position and the operating voltage are chosen to match the application. So far, we have delivered tubes with up to eight sources and operating voltages up to 500kv. 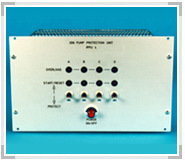 We offer an extensive program of peripheral equipment for use with the flash x-ray systems.